This extra locating bracket is first. I test fitted it and found the slot too narrow, but nothing a bit of sandpaper didn't fix. 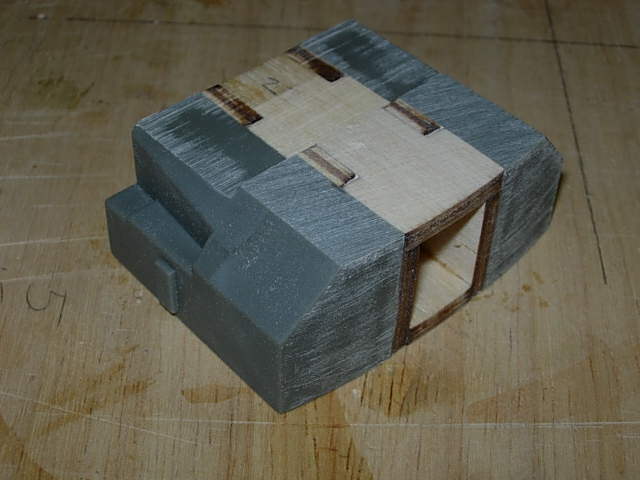 I made sure that the section of superstructure sat square before the glue dried. Not sure what this bit is, but again, I test fitted it, sanded as necessary and glued the two plastic parts together with Araldite. I sat it in the cut-out to keep it upright while the glue set. The wooden parts are going to be fitted after I've sealed and sanded the deck in that area. 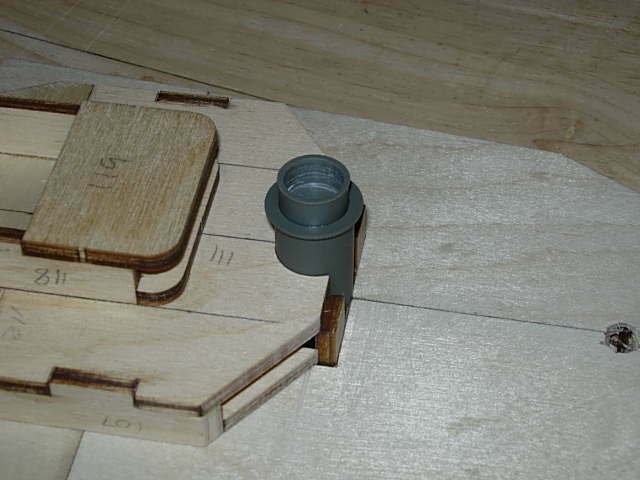 The hanger parts will wait until I've received the etched brass bulkheads that cover the aft of the hanger. I want to make sure that they fit perfectly. 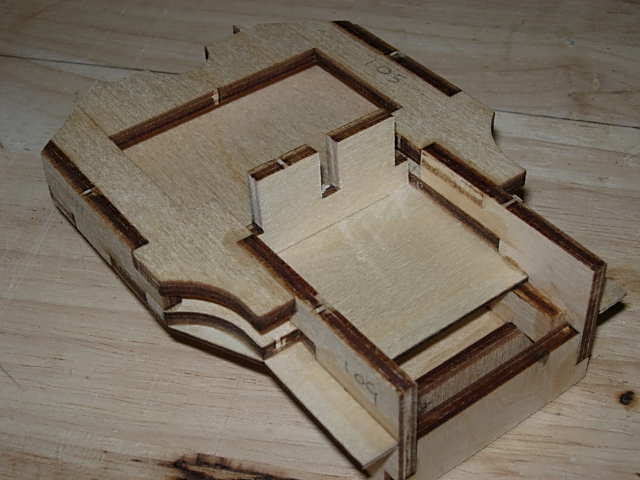 It is much easier to adjust the width of the wooden part before gluing the plastic, than it is adjusting the overall assembly. Now that I've got the hanger door in issue 57 I have checked the width of the hanger against the door. Sure enough, it was a fraction too wide, so I sanded it down until the hanger door etching fitted properly. 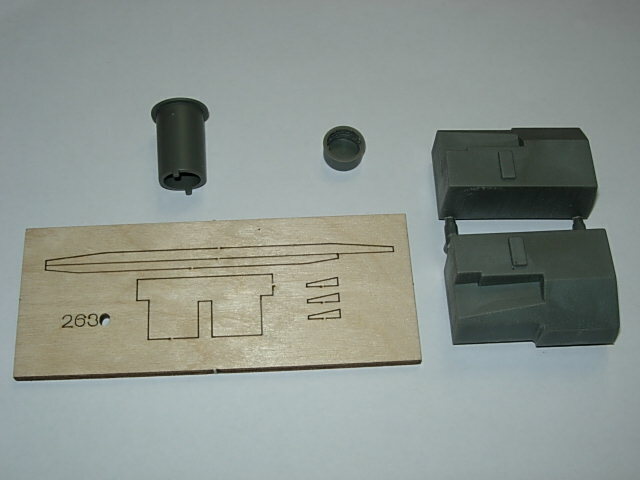 The plastic parts were glued on, one side at a time, using Araldite. 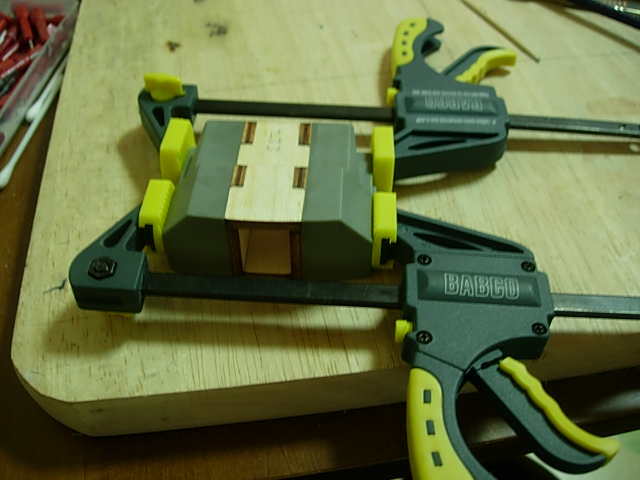 The photo below shows the second side clamped in place and the glue drying. 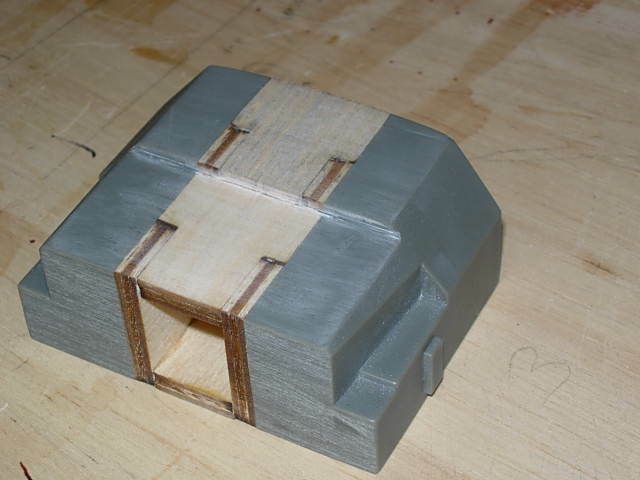 Once the glue was dry I sanded the front, back, top and bottom to remove any unevenness. Here is the finished article. Looking ahead, it's quite likely that there isn't any covering to go over the hanger roof. Therefore I've sanded it smooth, filled the small gaps with super glue (quite a good filler for very small gaps), and given is a coat of home made sanding sealer. Finally, it's given a good sand with 800 grit paper to give a smooth paintable finish. The result is below. Stern deck part 63 not fitted. It's sometimes a good idea to wait until you get parts further on in the series to check the proper fit.